« Scambiare, barattare i giocattoli. Swapping is becoming more and more popular, this is a perfect way for saving some money and be a little greener too. 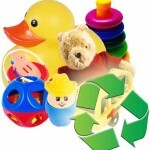 Toy swapping is a good idea to keep your children playing with “new” or “different” toys without spending money!. We did our first toy swapping and really had fun, our children played together and picked up and took home the toys they liked the most and mommys had some relax with tea, biscuits and enjoyed a different afternoon in company of the children. – If toys function with batteries, then batteries charged. – Toys brought in paper bags, to eliminate plastic and everyone will get then the bag in a suitable size to bring toys to home. -Age: almost same age to be able to exchange properly. Pay attention also about having enough toys for male and female. -Place: you can organize at home or as an extra activity in school, in a park ( depends of the weather). In our case we met in the kindergarden right after the clousure time. – To Be careful : Children should not pick up their own toys. If some kids want the same toy, then be patience and let’s them share for the meanwhile. Mommy can discuss later and know which toys will be really useful and how to distribute them, think that you can met again and swap again! You can also start your own toy co-op with your friends and neighbors. You can either buy toys communally and then have them rotate on a schedule or just agree to pass on your own toys every few months.